A Texas man got his dying wish to marry his fiancée thanks to a scrappy hospital staff and his dedicated family, who cobbled together an inpatient wedding ceremony hours before he died. On Friday morning, 33-year-old Raul Hinojosa, nearing the end of a four-year battle with chronic lymphocytic leukemia, told the staff of Baptist St. Anthony's Hospital in Amarillo he needed one last thing. "I want to marry her," said Hinojosa, according to the Amarillo Globe-News. "I want her to be mine." Hinojosa was talking about his longtime bride-to-be, 34-year-old Yvonne Lamas, who he asked to marry in 2007, the Globe-News reported. He dreamed of the perfect wedding for his future bride and over the years tried to save enough money to make it a reality. So on Friday, with hours left in Hinojosa's life, a nurse put out the call to hospital staff to see if they could grant Hinojosa's final request, the Globe-News said. Within hours, the hospital's staff was able to organize a wedding ceremony, complete with a wedding cake made in the hospital cafeteria, CNN reported. A hospital staff member gave Hinojosa the suit off his back, family members fetched Lamas a wedding dress and the hospital's chaplain secured a marriage license when a judge waived a 3-day waiting period. Shortly before 1 p.m., critical care employees formed an aisle, where Lamas and her father walked to Hinojosa, who sat upright in his hospital bed wearing a blue shirt, tie and black pants. "When I walked down the aisle and saw him in the suit, he just took my breath away," Lamas told CNN. "He was so handsome. It was priceless." The couple sealed the moment with a kiss in front of family, their children and hospital staff. 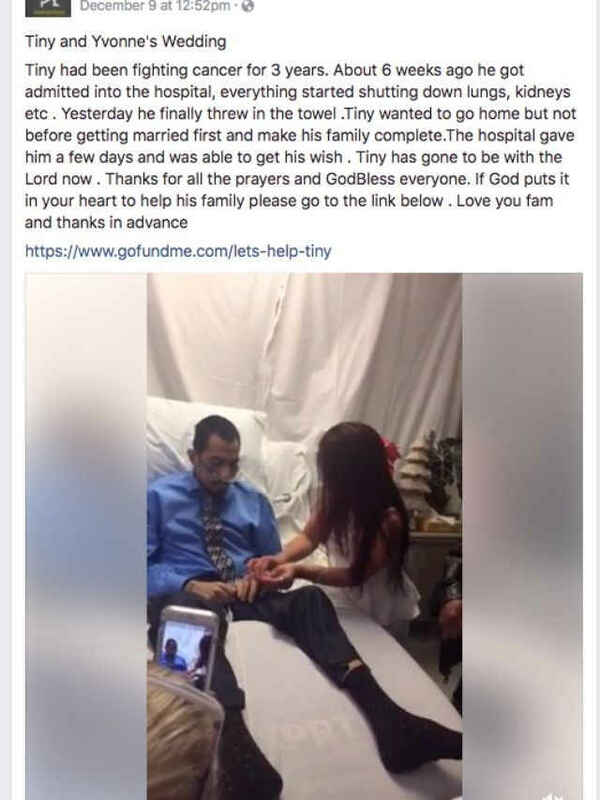 The ceremony was captured on a video posted to Facebook, which links to a Go Fund Me page to help with the family's utility bills. Thirty-six hours after the ceremony, Hinojosa died. When Lamas signed his death certificate, CNN reported, it was her first time signing her married name.